Ride to hidden glaciers from a traditional Patagonian ranch, you will spend your nights in a small outpost equipped with bunk beds! 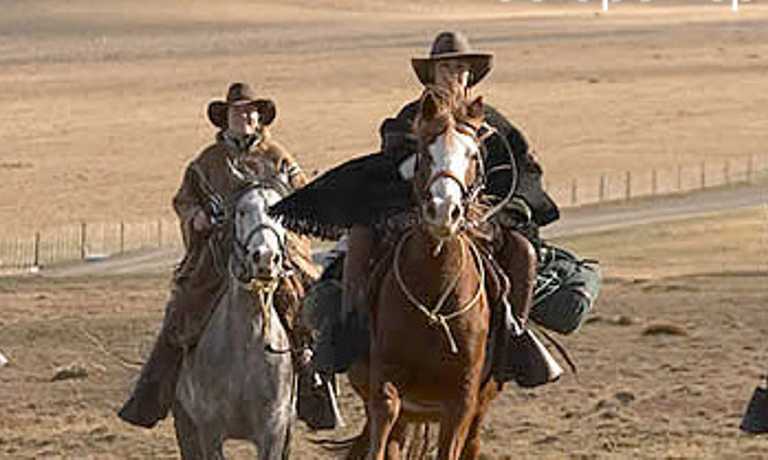 A real chance to live the Patagonian life, seeing the surroundings from the saddle. End your trip with a traditional Lamb BBQ. Arrival and opportunity to explore the Estancia grounds by bike or foot. 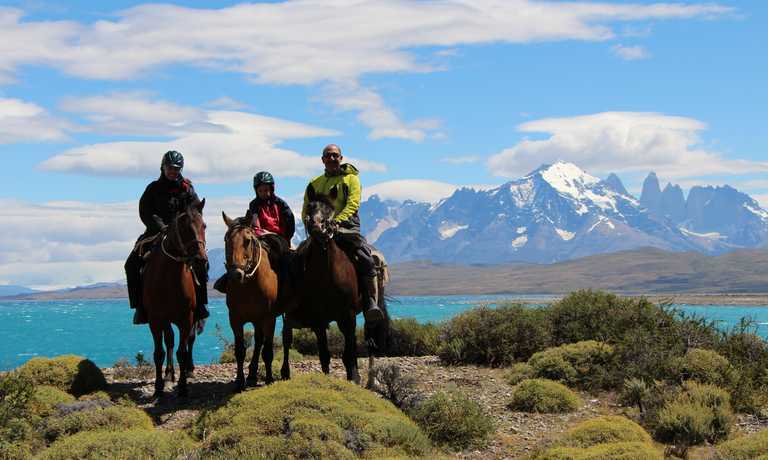 Ride the Cordon los Cristales mountains, views of Frias Glacier, night in cosy outpost. 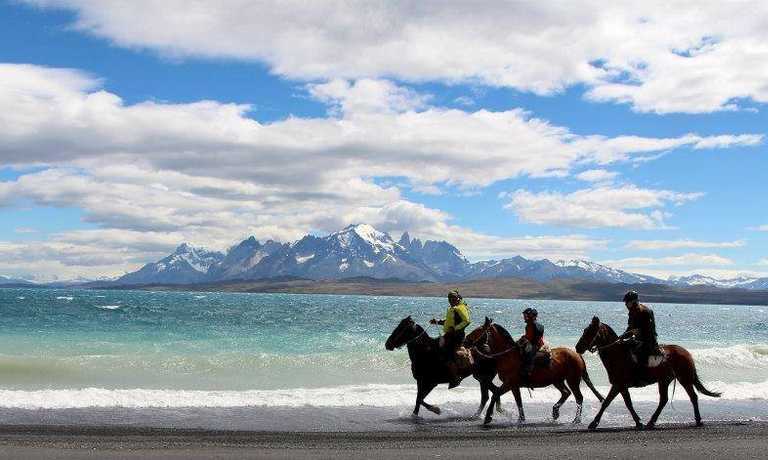 Round trip ride along the Lake Argentino, to view the hidden glaciers. Return to the Estancia to enjoy a lamb BBQ lunch before onward travel. Afternoon arrival at the Estancia, taking the regular transfer from El Calafate. After settling in, the guide will explain the program. The horses will be prepared and other equipment made ready to set off early the following morning. 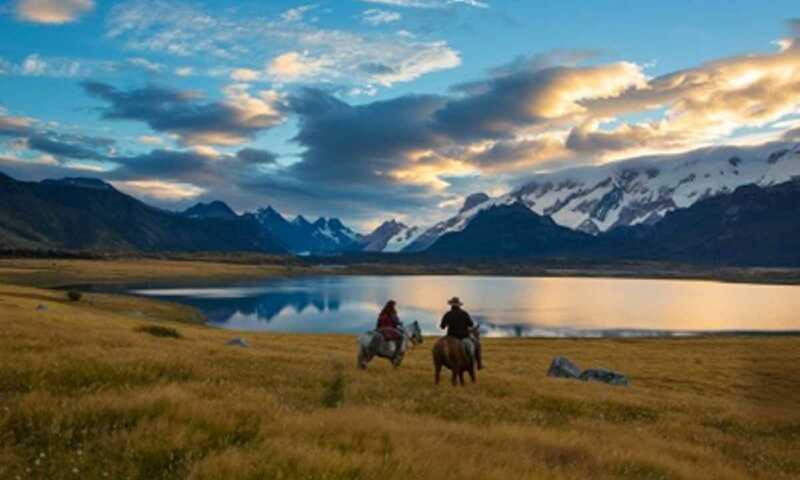 The estancia is actually within Los Glaciares National Park on the shores of the Southern Arm of Lago Argentino. It covers an area of over 12,000 hectares reaching as far as the border with Chile. Formerly it was devoted to sheep rearing. Nowadays a small flock is kept, its chief production being the breeding of Hereford cattle, of which it has developed a prestigious breeding herd. The rest of the afternoon and evening are free to enjoy the estancia, exploring its surroundings by bike or on foot, finding one's own way along the footpaths and tracks and also taking part in the sheep-shearing demonstration using traditional hand shears. Evening meal and spend night at the Hostelry. Morning ride to start climbing up the mountain range Cordon de los Cristales, which lies behind the Hostelry. The higher we go, the more clearly the lakes stand out, Brazo Rico and Sur, Lago Roca and Cerro Frias, as if it were all a model. Once we reach the clearing, the track plunges into the Patagonian Andean woods. We pass between lenga trees and guindos [Magellan beeches], riding along old tracks where the great sheep drives used to pass. We reach a little clear land, where cows graze. There, La Rosada outpost is the home of the "puestero", who is in charge of cattle and carries on the legacy of traditional rural production. He knows every single corner of the part of the land and he can count the cows with just a glance. If one had escaped, he would bring her back within a couple of minutes. There, we have first ranch lunch. By the afternoon, we reach a historical point: the International Milestone that indicated the end the estancia and the end of Argentina. The sensation to be at the very frontiers of Patagonia is unique. It is the south of the south: wind blows and the flag waves. The landscape and its calmness never end. Free time to explore surroundings. Dinner and night at outpost. On coming out of the dense woodland the way opens out into the Valley of the Rio Cachorro. Notros [Chilean firebush] and calafate bushes here are unusually tall. We start descending towards the lower land until we come to the riverbed. Surprise views of the Frias glacier appear at the bottom and the granite needle called "el Dedo del Cesar" [Caesar's Thumb]. Riding between rocks and pasturelands and avoiding the marshlands, we reach the corrals of the Rio Cachorro outpost where the rangers might be working with the livestock. After a picnic lunch we continue on horseback to Laguna 3 de Abril (3 de Abril Lagoon), a habitat of flamingos and black-necked swans, kaiken [upland goose] and steamer ducks, as well as of numerous salmonidae. Passing the lake, we come to the outpost, and after unsaddling, there will be time to enjoy the surroundings and the cosiness of the refuge. A wood-fired stove and a brick and clay oven, with the gentle light of the lantern, passing the mate round, the evening meal will be prepared while tales of adventures are shared. The outpost has a room with 3 bunk beds and a room that serves as dining room and kitchen where there are another two benches that turn into beds. Basic facilities. We leave after breakfast, riding south to the Balcony of the Glaciers. The track runs parallel to the Southern Arm of Lago Argentino. A little before arriving at the head of the lake, we leave the horses grazing to go up on foot to a viewing point even higher up. From there we will have a panoramic view of the Southern Arm, Laguna Corazon and of the Lago Frias, with glimpses of the Hidden Glaciers Gorra, Frias, Grande and Dickson in the distance. We walk to the beach at the head of the Southern Arm. From there we cross a large pasture, a pristine area. An erratic stone of more than 20 meters in height will be the next goal. It is impressive to stand in front of such a huge rock, marked by the force of the glaciers advancing and receding. The footpath starts to run alongside the lower Frias River. Here we will find traces of the area's livestock rearing past, a hanging bridge over 100 years old, destroyed by the great flooding of Lago Argentino in 1937. The way passes through dense woodland getting as far as discovering Corazon Lagoon, with crystal clear waters where the deep blue contrasts with the green reflection of the woods. The water is so crystal clear that it is possible to watch the trout swimming between the rocks. We pause for lunch. A place sheltered from the world. Whoever wants to will be able to carry on a bit further clambering over some stones that prove fairly awkward for crossing, in order to get to the southern end of Frias Lake, the natural border protecting the glaciers hidden in the mountains further south. In the afternoon we return to where the horses were left in order to ride back to the Puesto Laguna 3 de Abril, where the night will be spent. The return is begun riding along the shore of the lake until we reach the main buildings of the estancia, about 18km from the refuge. We will arrive in time for lunch with a typical Patagonian lamb roasted at the stake over charcoal embers, which will be ready just as the riders arrive. After lunch, regular transfer service back to El Calafate. I commend Nibepo Aike on all of their staff, their horses and the experience they offer. I also loved their garden, the food was excellent, and it's just a beautiful estancia with a palpable sense of place. This trip is best enjoyed by those who can and want the freedom to ride without feeling like they're on a tourist trap trip. This trip can run as a group trip, with prices starting from $770 per person for a complete group. If you are looking to join a group or you are a solo traveller we will help to form likeminded groups of travellers. Please let us know your travel plans. 3 Days Horse-Riding + 1 Day Horse-Riding & Hiking.